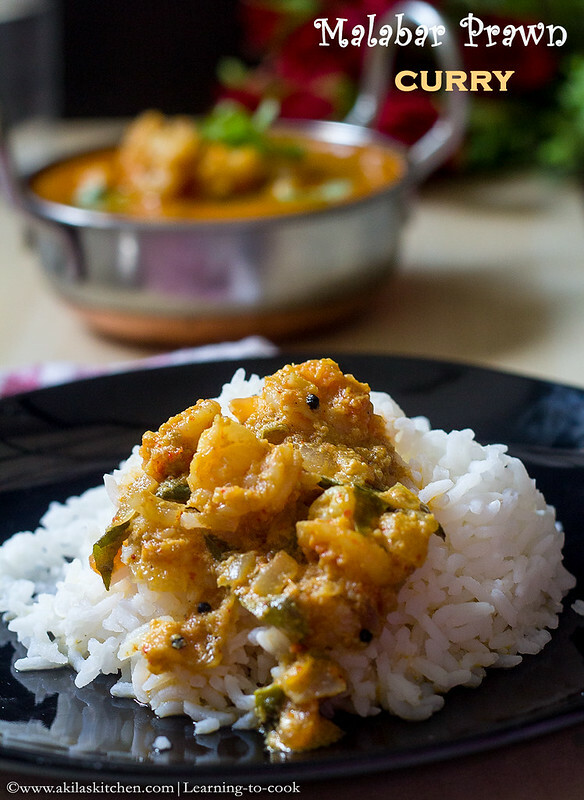 Malabar prawn curry recipe is made up of the juicy prawns, blended with coconut masala and cooked in coconut oil, gives a very rice and unique taste. 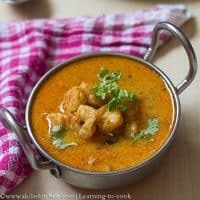 Malabar prawn curry recipe with step by step pictures for your easy understanding and learning. Malabar Prawn Curry is my kids favorite curry. It tastes great with steamed rice or with idlis or Aappam or even with chappathi or roti. It can be made as a spicy one or with mild spiciness. I made with less spicy as I need to feed my daughter. I took the recipe from here. 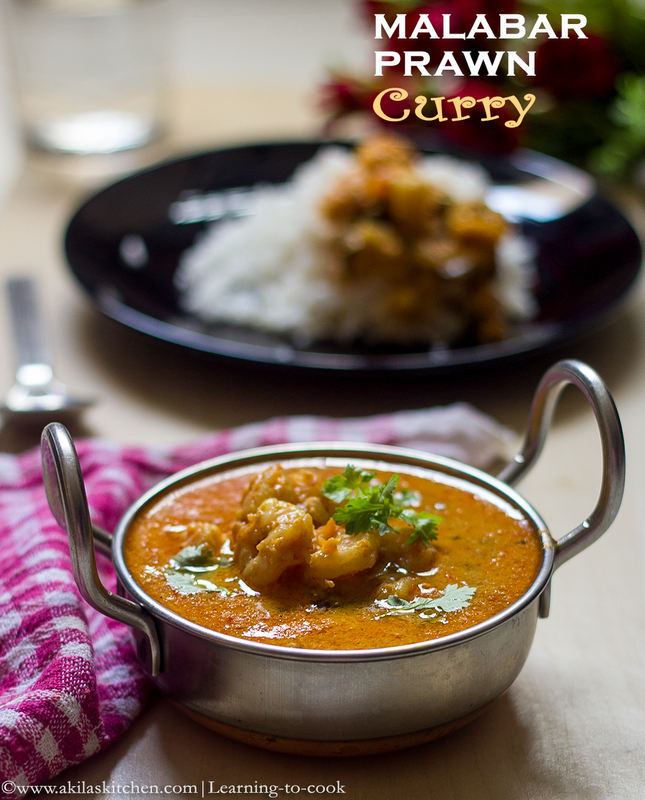 If you want to look for some tangy and spicy prawn dish you can have a look on prawn thokku or prawn gravy. For spicy dry version prawn dishes look on to Andhra style prawn fry or chemmeen roast. Let’s check on Malabar Prawn Curry and it’s preparation. 1. Clean the prawns and wash with salt. In a pan add coconut oil. Keep the flame in medium. When it is hot add the mustard. When it splutters add the Urud dal. 2. Add the curry leaves now. Fry for 30 sec. Add the chopped onion. 3. When the onion is translucent, Add the ginger garlic paste and green chilli and fry till the raw smell of ginger garlic goes off. Add the tomatoes and sauté them well till it becomes mushy. 4. Add the chilli powder, coriander powder, cumin powder, turmeric and salt. Allow to cook for 1 min. Now add the prawns and mix it well with the masalas. 5. Do not add any water as the Prawns leave out water. When they leave out water add the thin coconut milk and cook for 5 min. 6. Prawns would be half cooked by this time. Allow the prawns to cook for another 5 min and add the thick coconut milk. 7. After adding thick coconut milk, do not cook more. When it just starts boiling switch off the stove. 8. Garnish with coriander leaves and serve hot with rice. 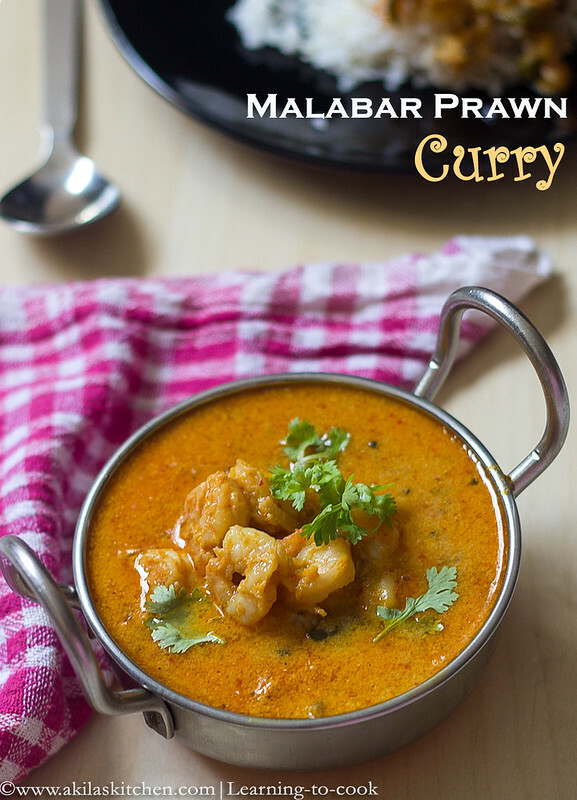 Easy and tasty Malabar Prawn Curry is ready. 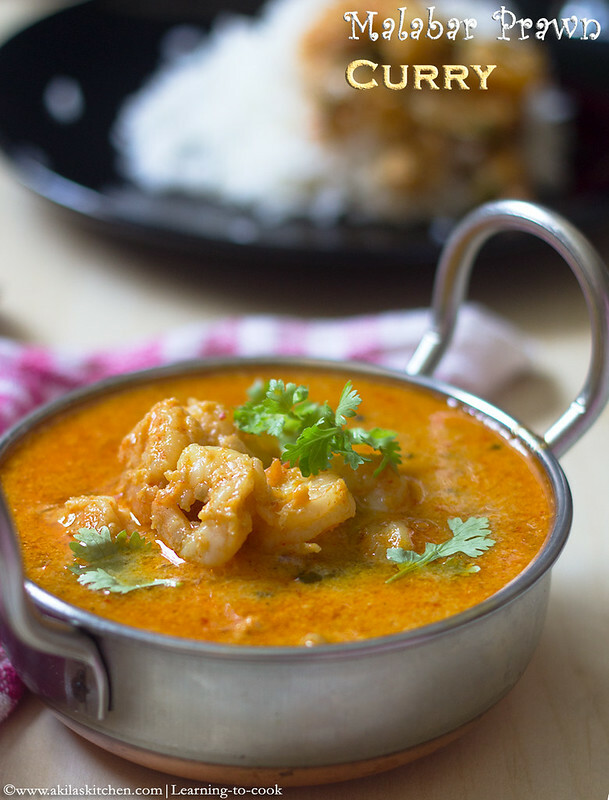 Malabar Prawn Curry is my kids favorite curry. It tastes great with steamed rice or with idlis or Aappam or even with chappathi or roti. It can be made as a spicy one or with mild spiciness. I made with less spicy as I need to feed my daughter. I took the recipe from here. If you want to look for some tangy and spicy prawn dish you can have a look on prawn thokku or prawn gravy. Clean the prawns and wash with salt. In a pan add coconut oil. Keep the flame in medium. When it is hot add the mustard. When it splutters add the Urud dal. Add the curry leaves now. Fry for 30 sec. Add the chopped onion. When the onion is translucent, Add the ginger garlic paste and green chilli and fry till the raw smell of ginger garlic goes off. Add the tomatoes and sauté them well till it becomes mushy. Add the chilli powder, coriander powder, cumin powder, turmeric and salt. Allow to cook for 1 min. Now add the prawns and mix it well with the masalas. Do not add any water as the Prawns leave out water. When they leave out water add the thin coconut milk and cook for 5 min. Prawns would be half cooked by this time. Allow the prawns to cook for another 5 min and add the thick coconut milk. After adding thick coconut milk, do not cook more. When it just starts boiling switch off the stove. *post first published June 5th 2014. Updated with recipe. Love it! I like anything with prawns! 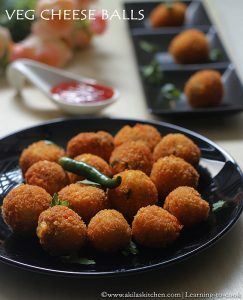 i love prawns like anything.Got to try this version of malar prawns..I am hungry now. Awesome Pictures and mouth watering recipes….looks really delicious!!!! Its so inviting and I love love the flavors. I usually leave the tail on when cooking prawns because they add a touch of natural sweetness into the dish. love this gravy, visit me too dear. Simply delicious and lovely looking prawn curry.Excellent preparation.